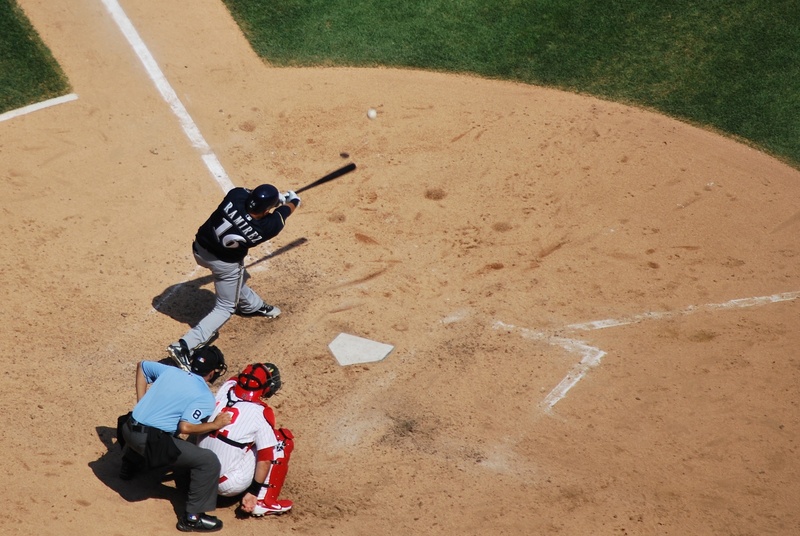 Sunday was getaway day for the Brewers and myself, and I was hoping for a smooth-sailing afternoon. Alex and Jess (my hosts in Chicago) joined me for the game, and we left their apartment in Logan Square just before noon for the 1:10 game. 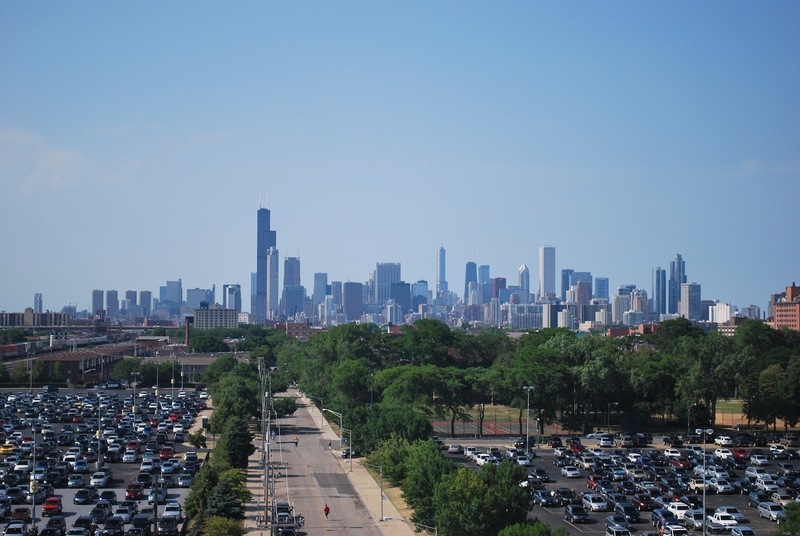 I thought this would be plenty of time because U.S. Cellular field is only nine miles away. I was wrong. The traffic wasn’t too bad, but once we got to the 35th street exit we realized we should have left much earlier. I’d say we were off the interstate by 12:15, but weren’t parked until 12:45. We quickly walked the 1/3 of a mile to get in the park, and made our way to the upper deck. Luckily the staircase provided a good spot for game photo number 72, because the seats towards the front of the sections were pretty much full 15 minutes before first pitch. 1) Minnie Miñoso, a 9-time All-Star whose full name is Saturnino Orestes Armas “Minnie” Miñoso Arrieta. He had five stints with the White Sox; 1951-1957, 1960-1961, 1964, 1976, and 1980. 2) Carlton Fisk, an 11-time All-Star who played for the Red Sox the first part of his career, and then the White Sox from 1981-1993. Fisk is most famous for his 12th inning walk off home run that won Game 6 of the ’75 World Series. The left field foul pole is at Fenway Park is commonly referred to as the Fisk Foul Pole, or Fisk’s Pole. 3) Walter William Pierce, better known as Billy. He was a starter for the White Sox, won 186 games for the them during his 13 years with the South Siders (1949-1961), and was a 7-time All-Star. 4) Jacob Nelson Fox “Nellie” played second base for the White Sox from 1950-1963. He was a 15-time All-Star. 5) Luis Aparicio played shortstop for the Pale Hose from 1956-1962, and again from 1968-1970. He was a 13-time All-Star. I put the Fox and Aparicio photos next to each other because that’s how they are positioned at the ballpark. Fox is flipping a ball to Aparicio, who is at the second base bag, something they likely did thousands of times (including practice) while they played together for seven seasons. 6) Harold Baines, a six-time All-Star who played for the White Sox from 1980-1989, 1996-1997, and 2000-2001. 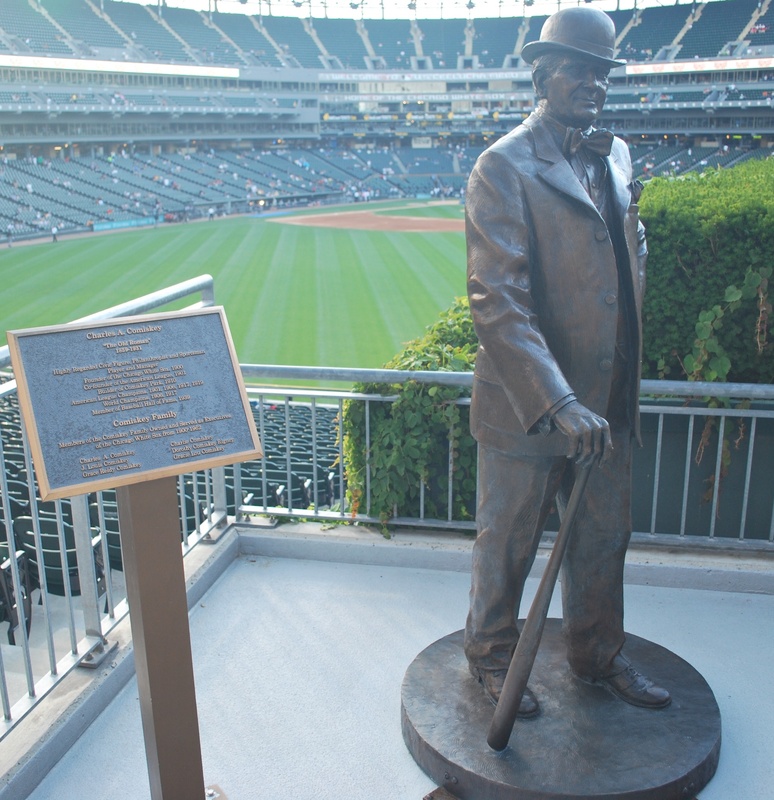 There was also a statue of Charles Comiskey at U.S. Cellular Field, as there should be. Charles “The Old Roman” Comiskey played in the majors from 1882 to 1894. He then managed a Western League team in Iowa, moved it to Saint Paul, and eventually to the South Side of Chicago and renamed the club the White Stockings. They joined the renamed American League, which became a major league in 1901. 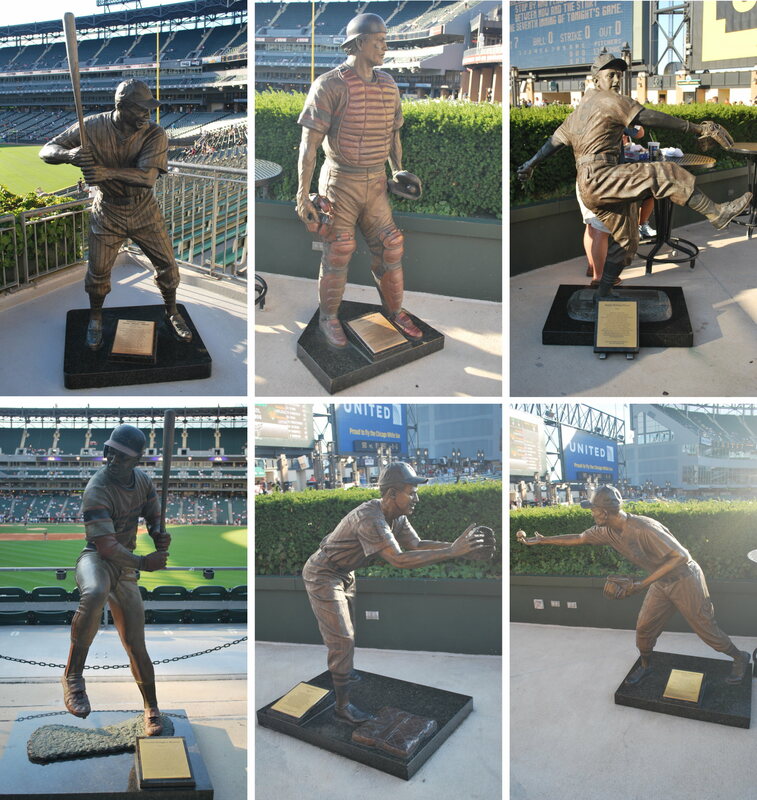 A lot of people still refer to U.S. Cellular Field as Comiskey Park, which was its name from 1991 to 2003. 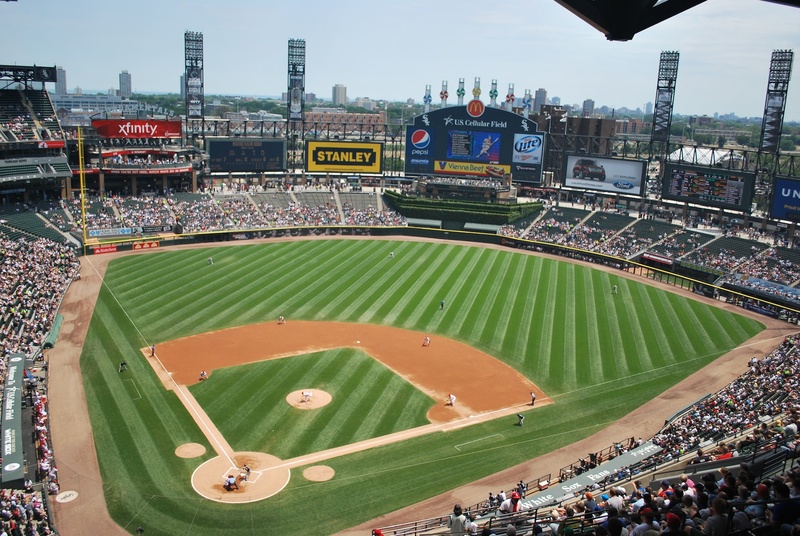 The White Sox played in one stadium from 1910-1990, and for 64 of the 81 years it was called Comiskey Park. 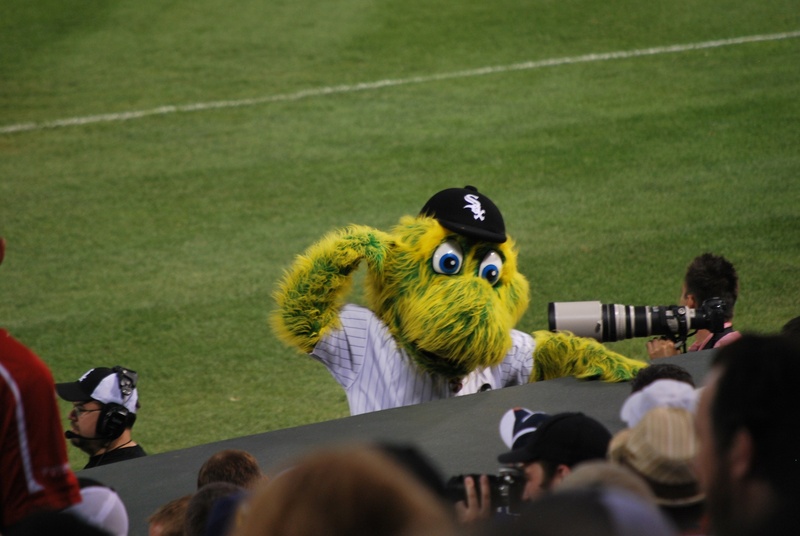 One picture that I didn’t post from Saturday’s game is of the White Sox’s mascot; Southpaw. I don’t think teams need to have mascots, but it’s mainly for the kids, so I’ll let it slide. Here is Southpaw as he tries to get the crowd going from the camera well. I’m not sure what he’s supposed to be, but he better be a lefty with that name (southpaw is slang for a lefty, and mainly used in baseball circles). Alright, back to Sunday’s game. Our seats were in the ninth row of 529 (in the upper deck) but we went all the way up to the last row to get some extra space. It’s also a little more breezy in the last row, and it was extremely comfortable up there. This was the view as Jose Quintana delivered the opening pitch to Norichika Aoki. There wasn’t too much action during the game, but the flying earwigs gave us something to think about. One landed on Jess’ shirt and she freaked out a little. One landed on my knee and I destroyed it after brushing it off, and another landed in my hair; not cool. Other than that we had a good time in the upper deck, and I recommend the seat location, as long as you don’t get stuck behind one of the many beams that support the roof. Mike Fiers was on the hill for the Brewers, and pitched very well, he pitched seven and a third, gave up five hits, one walk, no runs, and struck out seven. 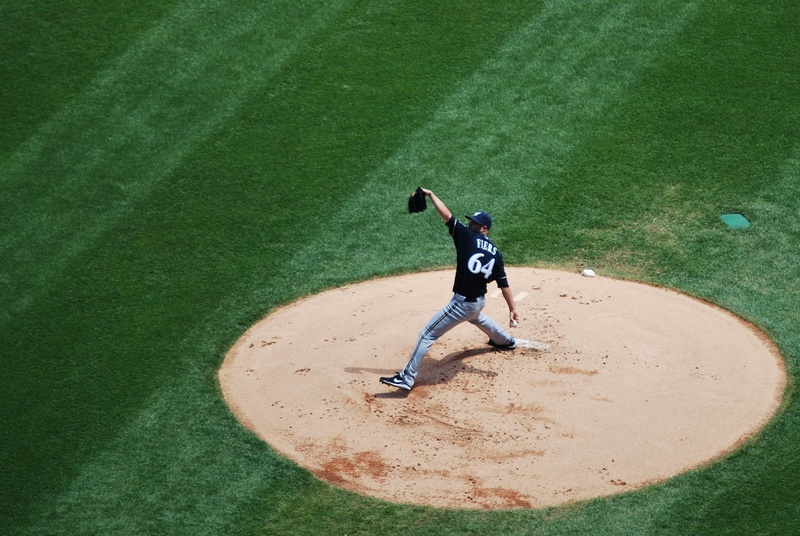 Here he is pitching in the first inning. There weren’t many exciting moments during the game, so Alex and I tried to get a good shot of a fielder making a catch in the outfield. Alex had a shot with the ball closer to the glove, but it was a little blurry, so I’ll declare myself the winner. 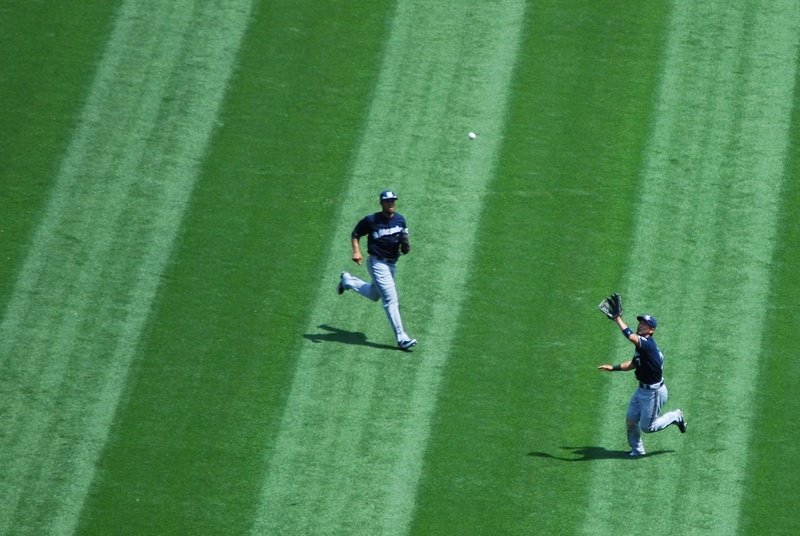 This is Aoki making a catch on an A.J. Pierzynski flyout in the bottom of the fourth inning. Again, I don’t have an amazing camera, so all my pictures are taken by just hitting the shutter once, not holding it. The really nice cameras can capture 8 or 9 frames per second, mine is somewhere in the 2.5 to 3 range, so I don’t even use it that way. In the fifth or sixth inning a Twitter follower and some of his friends came up and said hi. 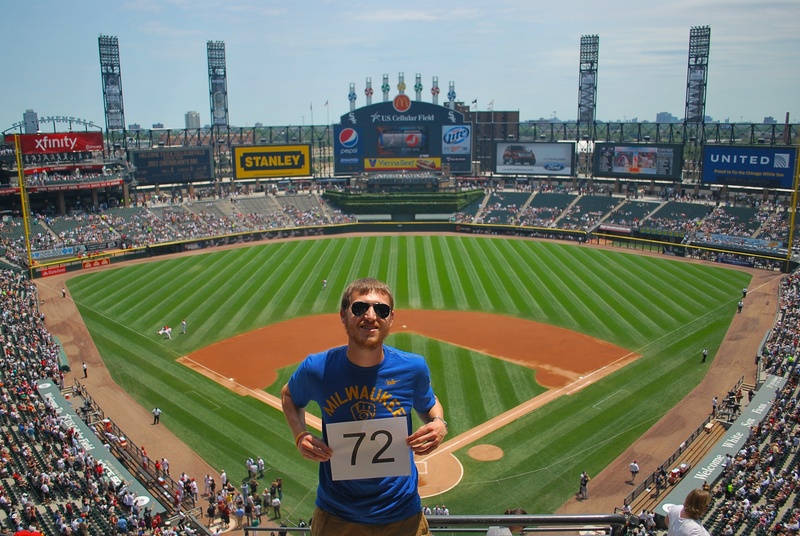 Kyle and his friends are going to tonight’s game in Cincinnati as well, and it’s always cool seeing other Brewers fans that are *almost* as crazy as I am. 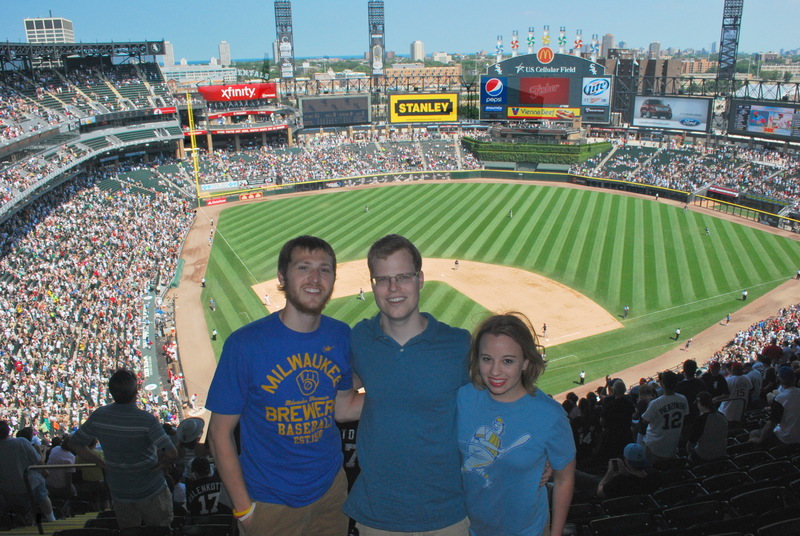 Before they took off in the middle of the seventh inning I had Kyle take a picture of me, Alex and Jess. Alex and Jess got married last June, and I stood up in the wedding as a groomsman. I can’t thank them enough for letting me crash at their place for 11+ nights this season. Their spare room has a couch that I’ve been sleeping on, but the room doubles as Jess’ closet, so I’m grateful that she puts up with me. I couldn’t do this without your guys’ help, so thank you! The game was scoreless going into the top of the ninth, when Aramis Ramiriz singled to left with one out. 1) Escobar lining Parra’s pitch to left-center. 2) Alejandra De Aza touching home plate with the only run of the game. Final Score: White Sox 1 – Brewers 0. 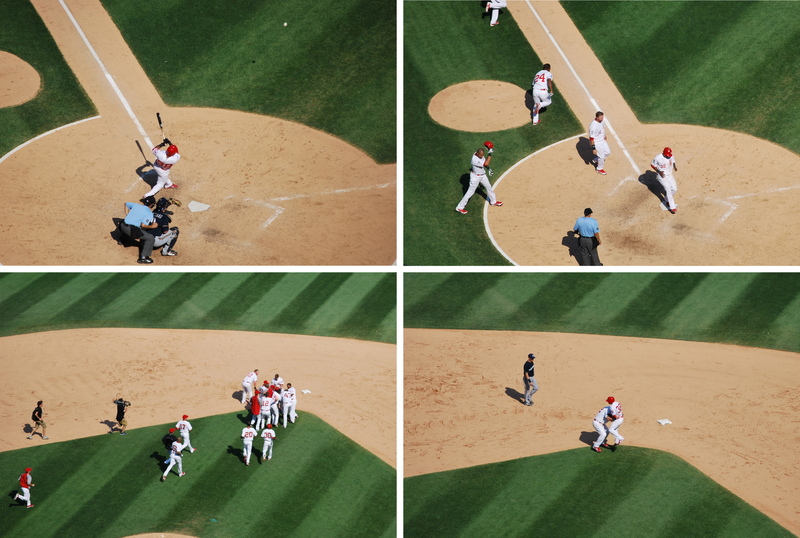 3) Adam Dunn barreling into Escobar. 4) The rest of the team celebrating the walk-off victory by giving nougies and body shots to Escobar as a way of congratulating him on a job well done. Ugh. To make matters worse, the escalators were all shut down where I wanted to exit, so I had to take the back and forth ramps all the way down to the ground level. Boooooooooo! Hisssssssssss! I don’t even think they have staircases that people can take, I know it would’ve been more painful, but I would’ve gotten out of there a lot quicker. The view of Chicago from the ramp is pretty legit, though, so I can’t be too upset. I got to my car at 4:40 and was on the interstate shortly thereafter. I made it to Cincinnati in exactly four hours and 45 minutes, and that included a 15 minute pit stop for some gasoline, a bathroom break, a Jack Link’s Beef Jerky stick, and an Almond Snickers. I’m staying with Prince in Cincinnati, and he’s a swell fella. He was born and raised in NYC, went to school at Penn State (BOOOOO, Go Badgers! ), lived in D.C., then Madison, now Cincinnati, and was a former hotdogger. Victoria met former hot-doggers when she was on the road as a Wienermobile driver back in 2009 and 2010, and now has connections in various cities. This is one of them. I’m going to hit up a local place for lunch today, then head down to Great American Ballpark around 4:30. I’ll be sitting with a local Brewers fan both Monday and Tuesday, and he’s hooked me up with free tickets to the game. Thanks Barry!